This library served it's purpose for over 3 years. 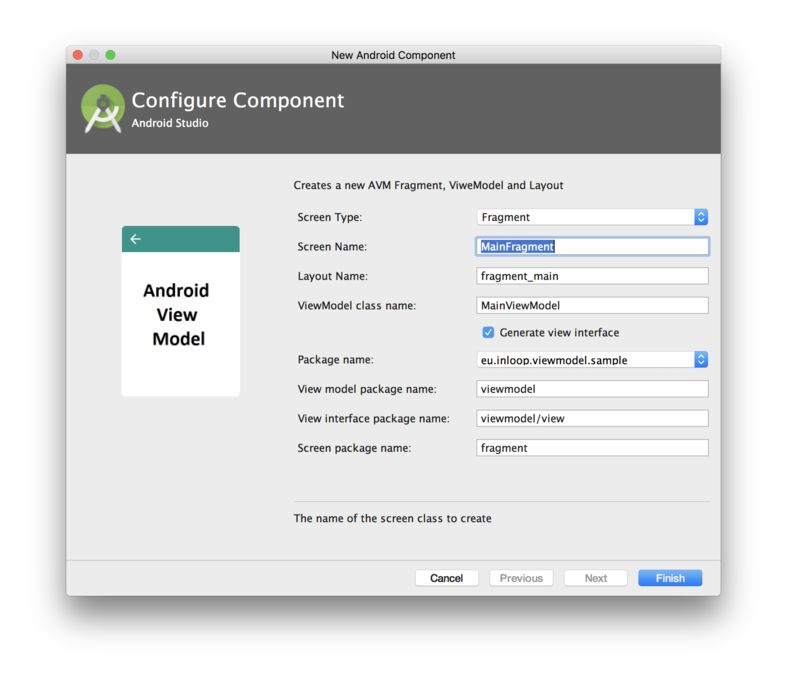 We believe that Google's Android Architecture Components are the preferred setup now for new projects. INLOOPX is dedicated to continue maintaining this library (no deadline on support end). 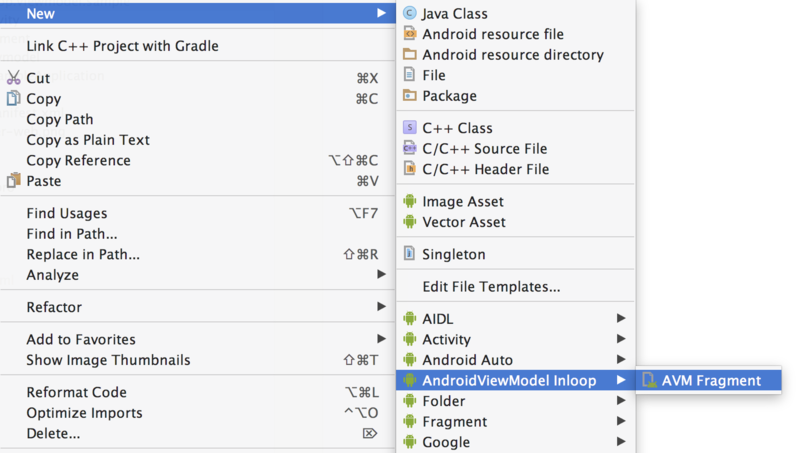 So rest assured that your existing projects don't need be migrated from AndroidViewModel because of this deprecation. We are only stopping new feature development and don't recommend using it for new projects. Basic idea behind this library. An instance of a ViewModel class is assigned to your Fragment or Activity during the first creation and is kept during it's life cycle, even between display orientation changes. The ViewModel instance is removed after the Fragment or Activity is completely gone (finished, popped from backstack, replaced without keeping it in backstack). You can execute asynchronous tasks in this ViewModel instance and this class is not destroyed during orientation change. All data handling and state logic should be placed inside this class. The Fragment or Activity is just a "dumb" view. Create an interface for your View by extending IView. We will call it IUserListView for this example. Your Fragment argument Bundle and Activity intent Bundle is forwarded to the ViewModel's onCreate method, which you can override to read the initial arguments for the ViewModel. Data binding is supported - extend ViewModelBaseBindingFragment.java instead of ViewModelBaseFragment and implement getViewModelBindingConfig() in your Fragment. That's it. You can then directly use ObservableField in your ViewModels. See example. The Android implementation of FragmentStatePagerAdapter is removing Fragments and storing their state. This is in contrast with FragmentPagerAdapter where the Fragments are just detached but not removed. We should be also removing ViewModels and storing their state to be consistent with this behaviour. Use ViewModelStatePagerAdapter instead of the default FragmentStatePagerAdapter. This class is only overriding the destroyItem() method and making sure that ViewModel is removed. The state is stored/restored automatically. You can also use the standard FragmentStatePagerAdapter - in that case ViewModels will be kept in memory and removed only when you leave the screen (Activity finished or Fragment removed). A unique global ID is generated for the first time your Fragment or Activity is shown. This ID is passed on during orientation changes. Opening another instance of the same Fragment or Activity will result in a different ID. The ID is unique screen identifier. A ViewModel class is created and bound to this ID. The corresponding ViewModel instance is attached to your Fragment or Activity after an orientation change or if you return to the fragment in the back stack. The ViewModel is discarded once the Fragment/Activity is not reachable anymore (activity is finished or fragment permanently removed). Don't forget to restart the Android Studio.